You don’t have to get your co-workers a holiday present. But a small token sure is a nice gesture for teammates you interact with daily, the cube neighbor who invites you to coffee, the mentor who offers encouragement, the colleague who has your back on those last-minute assignments, and the people whose coffee talks, pep talks, vent fests and validation get you through the daily grind. Taking the time to show you get and appreciate them contributes to office morale, holiday spirit and a happy work environment. So, don’t just say you gave at the office — consider doing it. 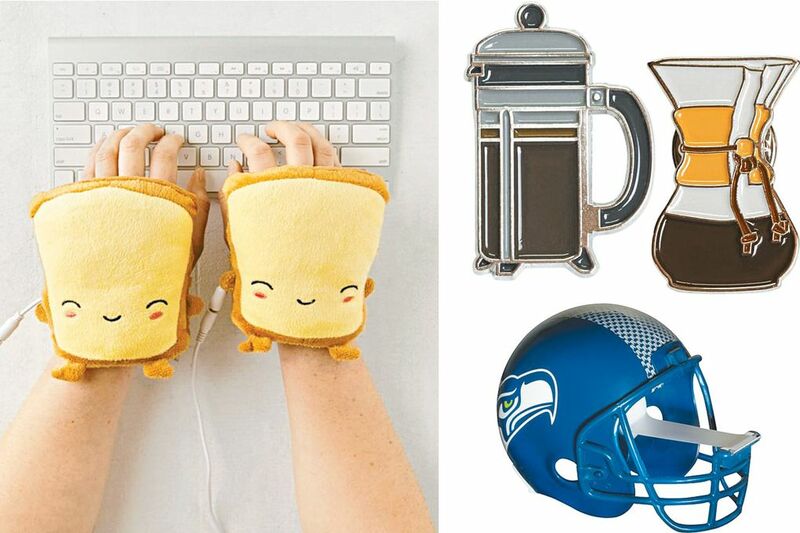 Here are 15 picks to help you spread a little workplace cheer. Thank them for being a friend with the “Golden Girls” Funko Pop! action figure that best fits their personality. 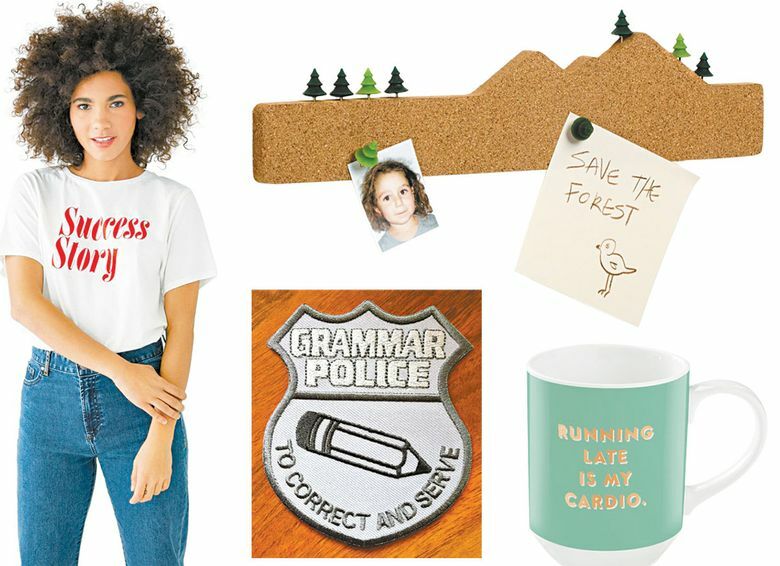 The pop-culture collectible from the Everett-based phenomenon will spruce up their cube and remind them of your appreciation all year long. Sold as a set of the Fab Four for your whole posse ($38) or by the friend ($9). You know someone who needs this “Running Late Is My Cardio” mug by Fringe Studio (on sale for $8.50). Maybe it’s even you. Perhaps filling this pretty, gold-lettered ceramic mug with 11 ounces of caffeinated goodness will help get them (or you) out the door on time? Showed up to work on time? Cleaned out your inbox? Celebrate accomplishments big and small with this super-soft, 100 percent cotton Ban.do jersey tee that shouts “Success Story” in retro red letters ($28). Not everyone gets a trophy, but everyone can get a T-shirt. Sizes XS–XXL. The new ErgoErgo stool ($100 at Design Within Reach), an ergonomically friendly twist on the balance ball, encourages active sitting, engages core muscles, improves circulation — and makes a thoughtful splurge for the fit yogi or beloved workaholic. The cool stool’s award-winning, modern design fits standard desks and comes in various colors and sizes. That co-worker who wears a Seahawks jersey every day — not just Blue Friday — signs their emails “Go Hawks!” and basically bleeds blue and green will appreciate this officially licensed Scotch Seattle Seahawks Tape Dispenser ($15) in the shape of a football helmet with the Seahawks logo. That is, if they don’t already have one. The mountains are calling, but you must work. The Monkey Business Mountain Memo corkboard ($15) — with nine adorable green forest trees for pushpins! — lends a breath of fresh air to a boring office cube and reminds them of what, and who, they love. Perk up a commiserating co-worker with a well-timed award: this gold foil-embossed “I Survived Another Meeting That Should Have Been an Email” Award Ribbon ($3.50), made in Oregon by artist Will Bryant. A little humor can go a long way. Welcome the new person with this trendy 10-by-10 office-sized Felt Letterboard ($32 at Alair, West Seattle) with 169 letters, plus emojis. 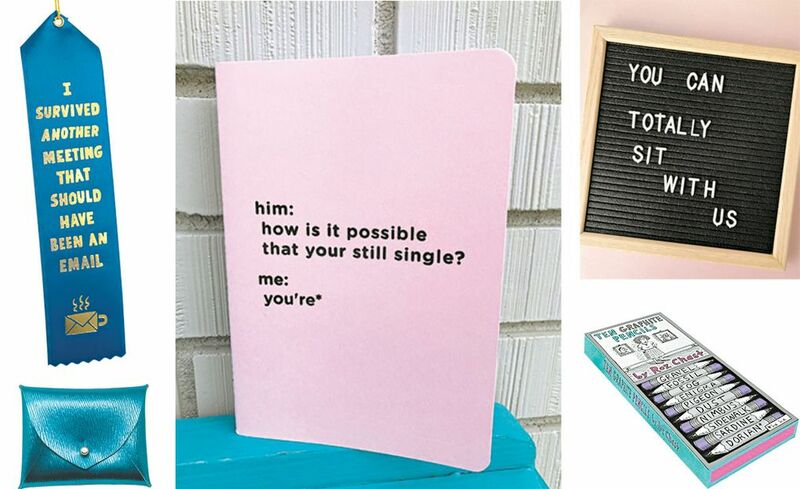 Customize it with “Happy first day,” “We’re glad you’re here,” “Great job” or “You can totally sit with us.” It’s a versatile, creative way to foster communication and build morale. Know someone fancy who deserves a chance to shine? The Moo-Young Metallic Leather Card Case ($48 at shopmoo-young.com and Concept Shop at Chophouse Row, Capitol Hill), handmade in Seattle by artist Francine Moo-Young in a brilliant array of colors, adds holiday sparkle every day. A Type A personality needs a Grade A bag to hold the pens that sign the checks. 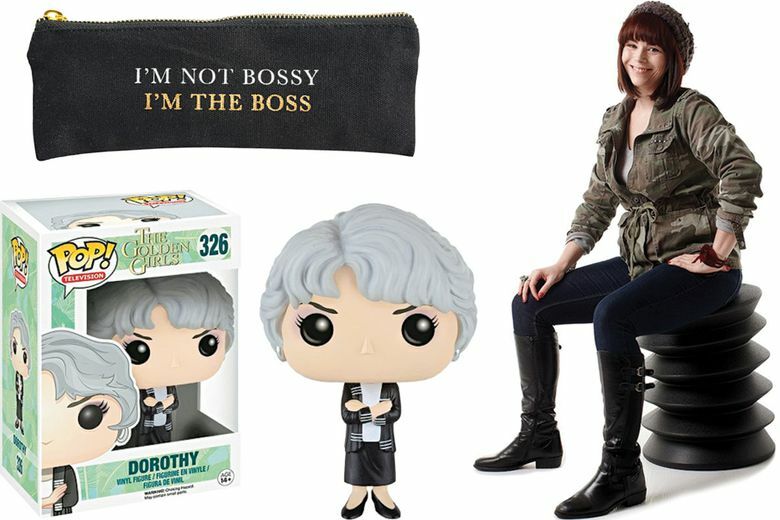 Show them you know who’s boss with this elegant, gold-lettered black canvas pencil case ($22) that reads, “I’m not bossy, I’m the boss,” from celebrated Seattle home company Rosanna Inc. This sassy 5-by-7 inch pink Meriwether “How are you still single?” Journal ($8.50) says it all. The experience is so universal, it sold out online, but you can still get one in at Alair in West Seattle. A common office temperature is 70 degrees, according to a 2015 scientific study. A common office complaint is that’s much too cold, according to female employees. Help her stay toasty with these cute-as-can-be Smoko Toast USB Wired Handwarmers ($35 at urbanoutfitters.com) that are, you guessed it, shaped like toast. Hands slip right through the fleece mitts to keep productivity (and body temperature) up. The designer (or anti-hipster) in your office will appreciate this clever set of 10 identical graphite Roz Chast Pencils ($12.95), individually wrapped with hilariously pretentious names: sidewalk, gravel, enigma, pigeon and more, illustrated by Roz Chast, a regular cartoonist for The New Yorker. Every office has one. Make it official with this 3.5-by-3.125 inch Grammar Police Badge ($5.25) from horror author J.L. Benét. Because nothing is scarier than bad grammar.